He rushed for 2,485 yards and 44 touchdowns to lead Bellevue to the Class 3A state semifinals. 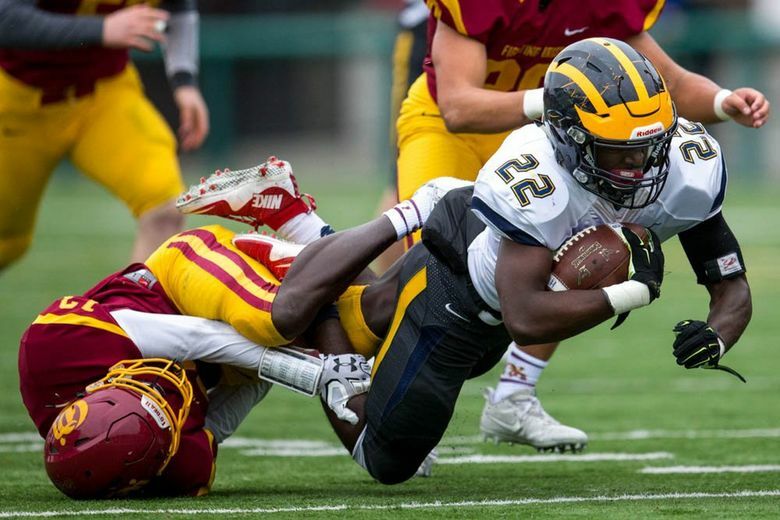 Bellevue running back Isaiah Ifanse was named the Gatorade state football player of the year Monday. Ifanse had a huge season for the Wolverines, rushing for 2,485 yards and 44 touchdowns to lead Bellevue to the Class 3A state semifinals. Ifanse was also named to The Seattle Times’ Star Times and All-State teams. CHICAGO (December 11, 2017) — In its 33rd year of honoring the nation’s best high school athletes, The Gatorade Company, today announced Isaiah Ifanse of Bellevue High School as its 2017-18 Gatorade Washington Football Player of the Year. Ifanse is the second Gatorade Washington Football Player of the Year to be chosen from Bellevue High School. The award, which recognizes not only outstanding athletic excellence, but also high standards of academic achievement and exemplary character demonstrated on and off the field, distinguishes Ifanse as Washington’s best high school football player. Now a finalist for the prestigious Gatorade National Football Player of the Year award to be announced in December, Ifanse joins an elite alumni association of state award-winners in 12 sports, including Mitchell Trubisky (2012-13, Mentor High School, Ohio), Greg Olsen (2002-03, Wayne Hills High School, N.J.), Matthew Stafford (2005-06 Highland Park High School, Texas), Harrison Smith (2006-07 Knoxville Catholic High School, Tenn.), Latavius Murray (2007-08, Onondaga High School, N.Y.), Brock Osweiler (2008-09, Flathead High School, Mont.) and Leonard Fournette (2014-15 & 2012-13, St. Augustine High School, La.). The 5-foot-11, 190-pound senior running back and defensive back rushed for 2,485 yards and 44 touchdowns this past season, leading the Wolverines (11-2) to the Class 3A state semifinals. In three postseason games, Ifanse rushed for 604 yards and 11 scores. He broke the 200-yard rushing barrier six times this fall and recorded 34 tackles on defense. Ifanse concluded his prep career with 4,158 rushing yards and 65 touchdowns. Ifanse has maintained a 3.02 GPA in the classroom. He remains undecided upon a collegiate destination. Ifanse joins recent Gatorade Washington Football Players of the Year Jack Colletto (2016-17, Camas High School), Jacob Eason (2015-16, Lake Stevens High School), Austin Joyner (2014-15, Marysville-Pilchuck High School), Reilly Hennessey (2013-14, Camas High School), Max Browne (2012-13 & 2011–12, Skyline High School), Kasen Williams (2010-11, Skyline High School), and Jake Heaps (2009-10, Skyline High School) among the state’s list of former award winners. As a Gatorade Player of the Year, Ifanse will be able to select a national or local youth sports organization to receive a grant as part of the Gatorade Play It Forward program. Every Gatorade Player of the Year state winner receives a $1,000 grant to donate and will have the opportunity to enter for an additional $10,000 spotlight grant by writing a brief essay explaining why their selected organization deserves additional support. 12 spotlight grants – one for each sport – will be announced throughout the year. To keep up to date on the latest happenings, become a fan of Gatorade Player of the Year on Facebook and follow the conversation on Twitter #GatoradePOY. For more on the Gatorade Player of the Year program, including nomination information, a complete list of past winners and the announcement of the Gatorade National Player of the Year, visit http://playeroftheyear.gatorade.com/.